You will have undoubtedly heard about Scrum, the most widely-used agile project management framework, especially for web products. Simon Gauraud, Senior Agile Coach at FABERNOVEL, shares his know-how about how to master and integrate Scrum within your company. 1 / WHAT IS AGILITY? => Agile methodology is similar to the Lean method and arose mainly during the industrial revolution with Ford and Toyota. In the highly uncertain and rapidly innovating world that we live in today, we are constantly under pressure to act fast. This is the same when it comes to agile methodology: we should favour the Lean method when launching new products, rather than long-term plans. 31% of web projects are never finalized, and an impressive 52% succeed, but they still need a higher budget and they often exceed the initial perimeter. 1- Individuals and their interactions, rather than processes and tools. 2- Operational products, rather than exhaustive documentation. 3- Collaboration with the client, rather than contractual negotiation. 4- Adaptation to change, rather than planning follow-up. => Who is the agility method for? Anyone in charge of developing a complex product, organizing a complex event or project, such as a wedding or home renovations. The idea is to prioritize what is the most valuable. => What are the benefits? - Less risk of planning delays. 2 / WHAT IS SCRUM? - Transparency: everyone in the team has the same level of information. - Inspection: each event is geared towards inspection. - Adaptability: you can adapt your road map. => Scrum is lightweight (it is the opposite of a vast collection of mandatory, interwoven components), simple to understand but difficult to master; you need to identify a Scrum Master. => Three roles: The Scrum Team consists of a Product Owner (at the core of the method), the Development Team (which brings expertise) and a Scrum Master (work facilitator). Scrum Teams are self-organizing (no hierarchy; you put the right person in the right role) and cross-functional (they include all the skills required to accomplish tasks without depending on others outside the team). The Scrum Team model is designed to optimize flexibility, creativity, and productivity. This is an ordered list of everything that is required for the product. It needs to be prioritised, user-oriented and pragmatic: it constantly changes in line with product and environment evolution. The Sprint Planning describes the work that needs to be performed in the Sprint. It answers three questions: What? / Why? / How? 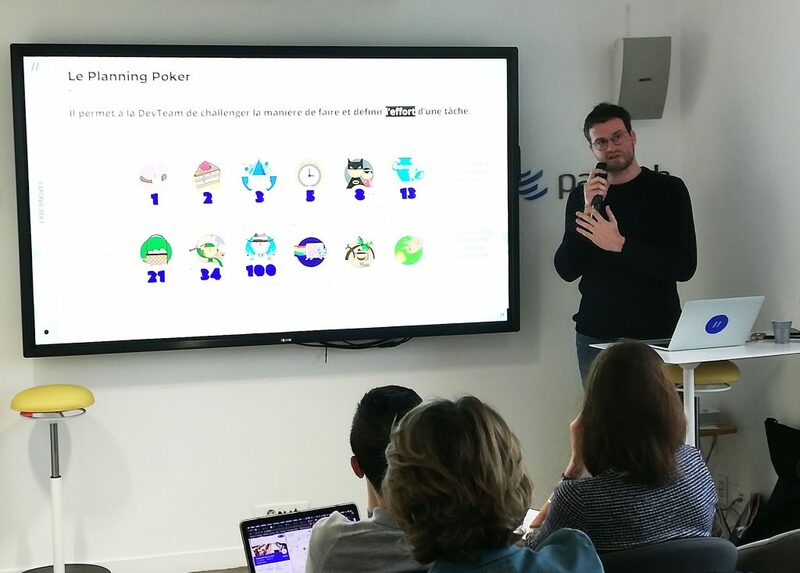 The Poker Planning enables the Development Team to challenge how a task is carried out and the effort required for this task (e.g., too complicated for one person, or, requires prior tasks, etc). The notion of effort is more important than time. Story Points are used to estimate the effort required to deliver a task. The Development Team forecasts what functionality will be in the next Increment (step) towards the Sprint Goal: To-Do / Ongoing / To check / Done. It states the work needed to be delivered in that functionality into a “Done” Increment. It makes the work identified as necessary to meet the Sprint Goal visible and is spread over a few weeks. The Daily Scrum is a daily 15-minute meeting during which the Development Team checks the following: What did we do yesterday? / What we are doing today? / What do we need to do to achieve our Sprint Goal? You hold a Sprint Review, an informal meeting lasting around four hours, at the end of each Sprint to inspect the Increment and to adapt the Product Backlog if necessary. The result of the Sprint Review is a revised Product Backlog that defines the probable Product Backlog items for the next Sprint. The Product Backlog may also be fully adjusted in the event of new opportunities. In comparison to a traditional project management method, you can show your users a functional product at any time, rather than having to wait right to the end. Your product develops at each Sprint, like a Russian doll. At the end of a Sprint, the new Increment must meet the Scrum Team’s definition of “Done,” meaning it must be in useable condition. The whole point of Scrum is to deliver a "Done" increment. A Sprint Retrospective is a one-hour meeting to build a continuous improvement plan in order to be ready for the next Sprint. The objective is to improve as a team and not as an individual. Each member of your team should validate their Scrum knowledge by getting their Scrum certification, so that everyone has the same level of information. Apply shu – ha – ri, a Japanese martial art: learn the basics, break away to find new ways, then transcend (adapt tradition to a situation). Work in a project room to boost productivity: favour visual management boards and tools such as OKR to reach your targets. You can use the MoSCoW model to help your product owners determine which backlog items the teams should work on next. It ranks different user stories on different priority levels: Must / Should / Could / Would. You then define a RICE score: (Reach X Impact X Confidence/ Effort). The idea is to focus on the value that you are creating for users. The idea is to inject a feel-good vibe into your Backlog refinement session. These sessions are designed to make your product ready for development. For example, you can assign a specific role to the Development Team members: Bank / Joker / Pragmatic / Time Master, etc. You can use a Burndown Chart to compare estimated and real velocity. When you identify a problem, make sure you define an action with a deadline and a manager in charge of it. This is key to succeeding. Invite your users (clients or internal marketing teams) to the Sprint Review to get their feedback and show them the progress being made, Sprint after Sprint. Everyone gives their insights about what needs to be improved. You can use different formats to make it more fun and avoid routine: Balloon (what gives us oxygen / what gives us weight) or Starfish (more, less, start, stop, keep).